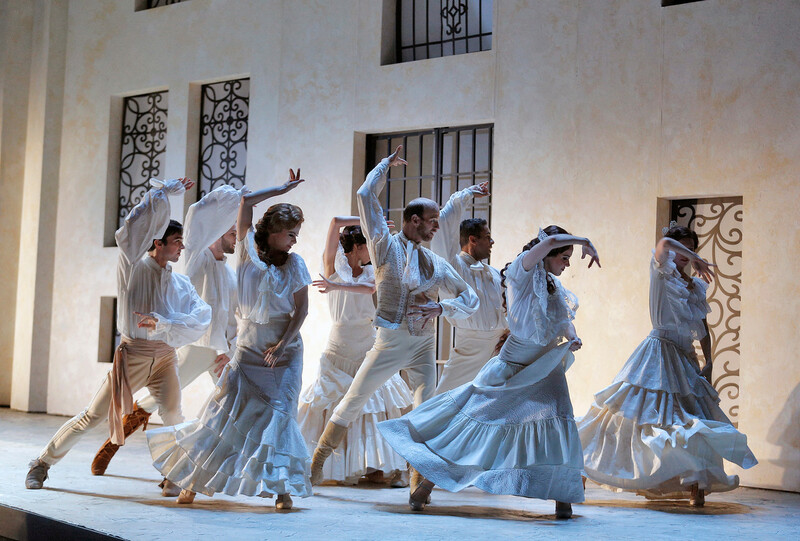 The flamenco-influenced dancing is an integral part of SF Opera’s delightful production of Rossini’s “Barber of Seville.” Photo Credit: Cory Weaver. Nowadays, most people understandably think of “Opera” as primarily a musical performance, more associated with the tradition of concert music than with the theatre. Traditionally, however, the makers of opera were after something greater: a balanced combination of poetry, dance, orchestral music, vocal music, acting, and theatrical design. The ideal is rarely achieved. When the ideal is approached, celebration is called for. The current production of Rosinni’s “The Barber of Seville” certainly calls for celebration. Emilio Sagi’s staging (beautifully revived by Director Roy Rallo) enchants and astounds in every detail. It is full of wit, sophistication, and slapstick in a beautifully balanced comedic stew. With every element in balance — acting, singing, choreography, musical accompaniment, all the design elements — it is a three hours’ vacation from all the cares of the world that cannot help but leave you smiling. Musically, tenor René Barbera gives the finest performance as Count Almviva, but all of the principals and supporting players are capable. Purists may understandably feel that the singing is far from the heights attainable in the Bel Canto style, occasionally overpowered by the orchestra, but, for my money, the excellence of the overall production overcomes many flaws. Daniela Mack is a beautiful, subtle, intelligent, and seductive Rosina. Lucas Meachem’s Figaro is full of joy and pinache. Alessandro Corbelli is riotously funny as Doctor Bartolo, and in exceptionally good voice. Corbelli is particularly impressive in that he sings beautifully without compromising the physical comedy. His commitment pays off in laughter. Equally skillful is the laugh-provoking work of Andrea Silvestrelli as Don Basilio. And, as house servant, Berta, the always excellent Catherine Cook nearly steals the show. Her scene with Efraín Solís as the silent Ambrogio is one of the evening’s comic highlights. The excellence of the performances extends to every member of the chorus and the corps de ballet. It seems as if each supernumerary has created a full comedic character and they are clearly having a great deal of fun. Adler Fellow Edward Nelson, as the orchestra leader Fiorello, is a standout, both vocally and comedically. The star of this production is the wonderful staging. I don’t want to reveal any surprises, but as the evening unfolds every entrance and exit becomes increasingly absurd, slapstick and unexpected, culminating in an over-the-top image that caps the evening with laughter. Clearly, revival director Roy Rallo has approached the original staging with respect and care and uncompromising professionalism. Giuseppe Finzi conducts the orchestra with precision and grace, capturing all the humor and charm of Rossni’s score, although, at times, overpowering the singers, particularly during some of the patter songs. This “Barber” certainly qualifies as a highlight of the current Opera season! “The Barber of Seville” plays for two more performances, Saturday, December 5th and Wednesday, December 9th. For further information click here. “The Barber of Seville” by Gioachino Rossini. Libretto by Cesare Sterbini after the play by Pierre-Augustin Caron de Beaumarchais. Sung in Italian with English subtitles. Production: Emilio Sagi. Revival Director: Roy Rallo. Set Designer: Llorenç Corbella. Costume Designer: Pepa Ojanguren. Lighting Designer: Gary Marder. Chorus Director: Ian Robertson. Choreographer: Nuria Castejón. Dance Master: Lawrence Pech. Fiorello: Edward Nelson. Count Almaviva: René Barbera. Figaro: Lucas Meachem. Rosina: Daniela Mack. Doctor Bartolo: Alessandro Corbelli. Berta: Catherine Cook. Ambrogio: Efraín Solís. Don Basilio: Andrea Silvestrelli. An Officer: Matthew Stump. Notary: Andrew Truett. Posted in Reviews.Tagged Alessandro Corbelli, Andrew Truett, Catherine Cook, Daniela Mack, Don Basilio, Edward Nelson, Efrain Solis, Emilio Sagi, Lucas Meachem., Matthew Stump, René Barbera, Rossini, Roy Rallo, The Barber of Seville.